Figure 1. Small painful ulcers on the mucosal surface of the lower lip. Figure 2. Mucosal biopsy showing focal ulceration with an intense neutrophilic infiltrate. A 36-year-old man developed a recurrent pattern of multiple painful ulcers measuring 2 to 3 mm in diameter on the mucosal surface of his lips (Figure 1), the sides of his tongue and the buccal mucosa. The ulcers would heal in seven to 10 days, but would recur at varying sites on the oral mucosa after several months. Painful ulcerated lesions on the oral mucous membranes may have a number of causes. Recurrent herpes simplex usually recurs at the same mucosal site and has an initial phase consisting of grouped vesicles. It typically involves the vermilion border of the lip and surrounding skin rather than the lip mucosa. Intraoral lesions are concentrated on the attached mucosa, such as the hard palate or gingiva, rather than the tongue or buccal mucosa. Biopsy reveals cytopathic viral changes within the mucosal keratinocytes, and herpes simplex virus may be cultured. Coxsackievirus may induce painful vesicles on the posterior oral mucous membranes as part of herp­angina, or on the buccal mucosa in hand, foot and mouth disease. Systemic symptoms such as fever and abdominal pain may occur, but resolve over a week as a single episode. Erosive lichen planus may produce recurrent, irregular, painful ulcers over the buccal mucosa and tongue. The ulcers may last for months and are bordered by a white lace-like pattern, which extends over the surrounding mucosa. Biopsy shows a primarily lymphocytic (rather than neutrophilic) reaction directed at the mucosal epithelium. Aphthous stomatitis is the correct diagnosis. 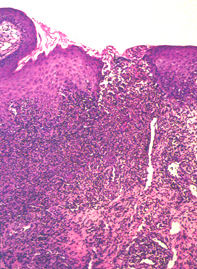 A mucosal biopsy showed a focally ulcerated epithelium. Under this there was an intense inflammatory reaction consisting mainly of neutrophils without evidence vasculitis or viral cytopathic changes (Figure 2). Aphthous stomatitis is a common condition affecting up to 20% of the population. The cause remains unknown, but the episodes have been attributed to the presence of Streptococcus sanguis, stress or hormonal changes in women (with monthly episodes). 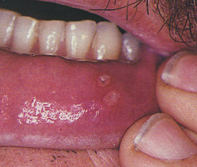 Aphthous stomatitis lesions are usually self-limiting. Symptoms may be helped by using a warm saline mouthwash, viscous lignocaine or fluorinated corticosteroid ointments in the early stages. In individuals with continuous and severe episodes, search for systemic disease such as anaemia, inflammatory bowel disease, gluten-sensitive enteropathy, vasculitis and Behçet's syndrome. Eye or central nervous system symptoms in Behçet's syndrome may necessitate specific treatment with intermediate dose of corticosteroids or immunosupressive agents such as azathioprine. Colchicine 0.5 mg twice daily, dapsone 50 to 100 mg per day, prednisone 25 to 50 mg per day for three weeks, or thalidomide 100 to 200 mg per day, have been used with variable success in severe aphthous stomatitis. Recurrent painful ulcers of the soft mucosal surfaces may represent aphthous stomatitis. This article was first published in Modern Medicine of Australia in March 1997. It was reviewed and updated in July 2011.